Great, Antoine, that you already pay attention to the judgment on your blog. It looks as though the Grand Chamber was sensitive to much of the criticism and outrage that was unleashed by the Chamber decision. Therefore in my view the Court scores high on legitimacy. To come to this result, the Court had to inflate the margin of appreciation, and to downplay the need to exercise European supervision. In that respect the judgment is not very convincing. 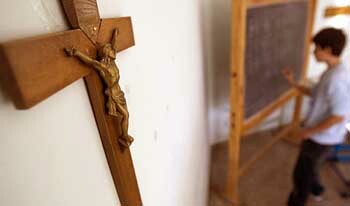 It may be true that the crucifix was not linked to compulsory teaching on Christianity and proselytising and that non-Christian symbols like Islamic headscarfs are allowed in schools, but that says nothing on whether crucifixes by themselves violate the Convention. The suggestion that Mrs. Lautsi can correct the damage done to her children in the way she raises them, will be seen by her as adding insult to injury. The Court in my view scores low on reasoning. If the Court had relied on the correct interpretation of Article 2FP in the first place, which allows parents to get their children educated in accordance with their religious beliefs, it would have come to the same conclusion. But now the Court had to use an inflated margin of appreciation to undo a bloated interpretation. Rerely do I with my country ECHR judge, but here I find judge Kalaydjieva and Malinverni's dissent persuasive. The public display of religious symbols has a long standing legal tradition in the United States. The nativity scene in public display cases include Lemon v Kurtzman (1971), Lynch v Donnelly (1984), and County of Allegheny v ACLU (1989). The problem is not secularism v Christianity. The issue should be using public funds and places to endorse a particular religious sector. In this case, the walls of an educational environment. The difference between the US and the EU is, the US is less likely to break apart simply because of different religious ideologies. Whilst in Europe, such differences could. Also, reading Lautsi along with Sahin v Turkey, Lautsi‘s protection of the mainstream Judeo-Christian view made Judge Tulken’s Islamophobic criticism against the ECtHR even more poignant.